Direct connection of instruments or devices at baud rates of up to 230kb/s per serial port. AGILENT Technologies has released a USB to RS232 interface for connecting up to four test instruments from the USB port on a PC notebook or desktop. 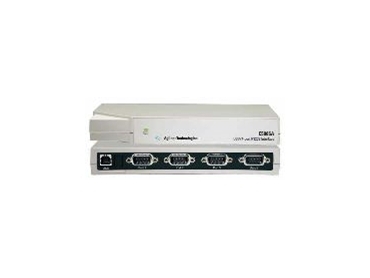 The E5805A provides direct connection of instruments or devices at baud rates of up to 230kb/s per serial port. There are no switches to set, no PC cards to install and no external power supplies required. It is a standard PC plug and play device. The included software makes the four RS232 ports appear as additional local ports on the computer. Also included are test industry standard software and drivers and VISA I/O libraries to enable instrumentation-style commands for RS232 control.